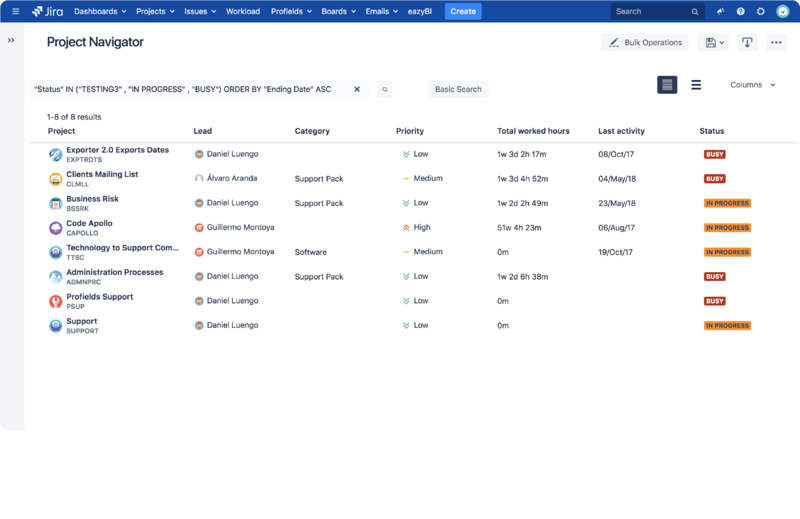 Expand your ability to organize, monitor and search projects in Jira according to the information that matters. 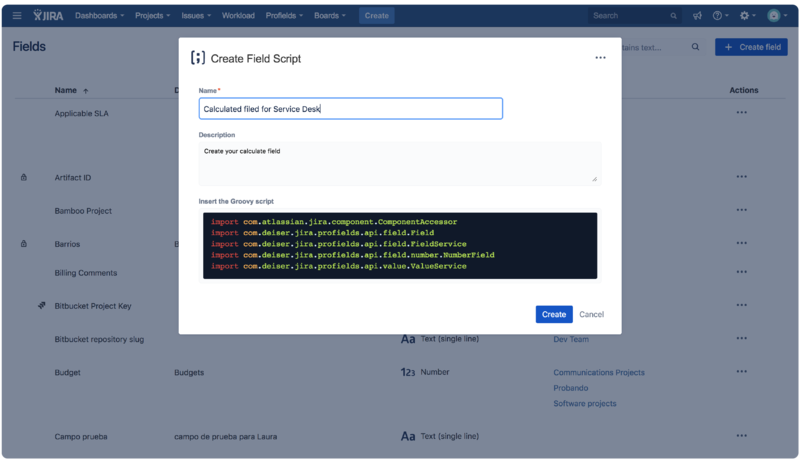 Use Profields to organize your portfolio of Jira projects, assign suppliers, communicate deadlines, track budget utilization, or monitor and evaluate. Profields streamlines project integration, making it the perfect ally of a Project Management Office focused on deliverability and agile decision making. Give more autonomy to your project admins: allow them to capture relevant information, craft project layouts and apply them to similar projects. Complete the map of your corporate processes, match project types to business categories, and get project-based reports. Expand your ability to organize, monitor and search projects according to the information that matters. "It works real well for us. We use it to track pre-paid development time. In each project, we need to track hours purchased, hours used and hours remaining. Using the calculated fields, we can see when it's time to hit the client for more time. Nice, straightforward plugin." "This plugin addresses one of the main problems I found in my Jira evaluation. All the power custom fields give you when working with issues is lost when it comes to projects. You just have the few standard fields provided by Jira and a single field called "category". What if I want to store information about the customer, the technology, ...? This plugin is the answer I was looking for. Good Work ! " "Really, it is very useful plugin and help us to implement important projecs. Support team is very professional, and explain every thing in details.... Thanks...."
"This Great Plugin empower your projects. 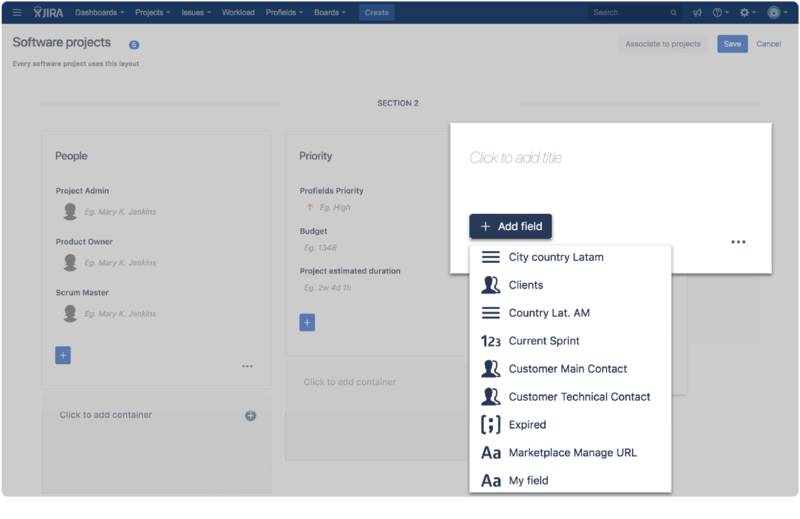 Customize your projects is easy and it gives great power to the Jira project management. Good Job. I recommended it." "Thanks for this very nice plugin that covers the huge gap left by JIRA in terms of project-specific information itself - name, key, avatar and a short description is simply not enough for a "project management system." "Great add-on and very reactive support team. 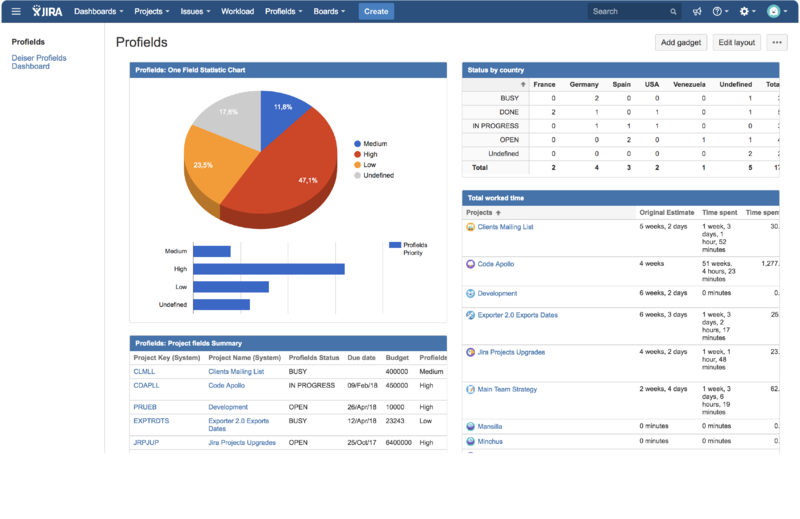 We've integrated our add-on - Rich Filters for Jira Dashboards - with Profields and they've been amazingly knowledgeable and helpful. Totally recommended." "Amazing add-on and very easy to use. This fills the void that I had of wanting to track custom properties at a project level (requester, estimated cost and duration, status, etc.) I also love the "Project Navigator", which allows me to create various custom views and easily export needed data into Excel for distribution and presentation needs." Apply changes to any number of projects at once and save hundreds of hours in project administration! 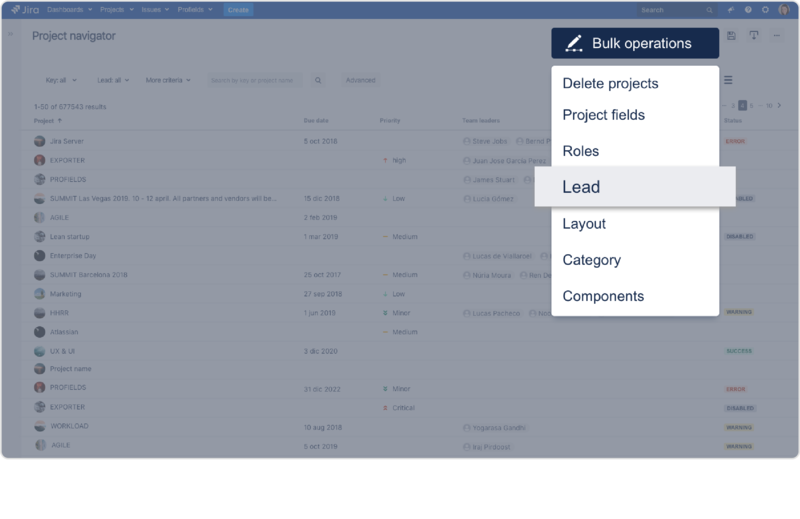 Supports: delete projects & associated schemes, assign project leads, assign users to roles or groups, update components, edit categories & Profields layouts and project custom fields. Project custom fields come in many different types: String, List, Numeric, Date, Priority, Script, User, Groups, and more. Choose a type for each new field, label it, and start using it in your projects! 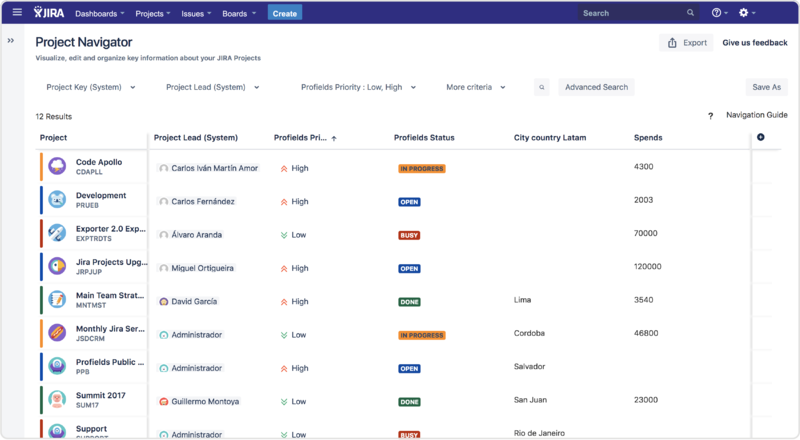 Enjoy the fullest Jira experience with a search engine that looks and works just like the issue navigator applied to your projects. Use Profields Query Language (PQL) and save filters for later! Software projects should carry different information than biz dev projects - stop mixing apples and oranges! Place your fields in reusable layouts and apply them to similar projects. Use groovy scripts to get calculated outputs automatically, or to connect to third-party tools. Would you like to know when was the last time the project was accessed? The total worked time? 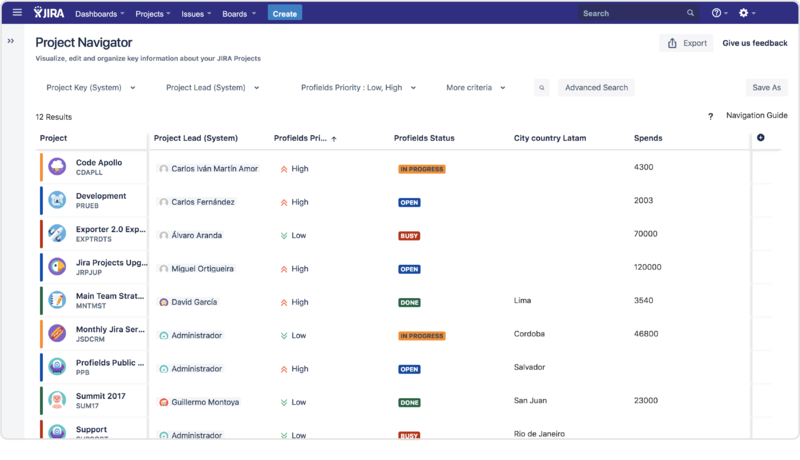 Report on your project portfolio with powerful gadgets for Jira dashboards and Confluence, and go even further with our eazyBI integration. 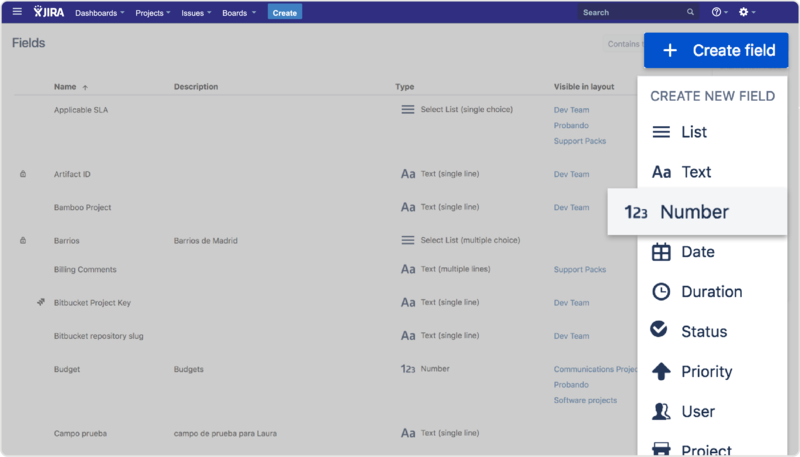 Supports: delete projects & associated schemes, assign project leads, assign users to roles or groups, update components, edit categories & Profields layouts. Profields cloud licenses are hosted by DEISER. Your subscription automatically renews every month. Annual pricing is also available. You are eligible for support and automatic version updates as long as your subscription is active.